Modern organizations are defined by their ability to quickly recognize evolutions in business and technology trends, then rapidly and effectively deliver value to the customer. Developing a culture of agility – information transparency, rapid iteration, role mobility and continuous learning to improve the business – has become a baseline for recruiting and retaining top IT talent. Contemporary Agile Frameworks – SCRUM, Lean Kanban, SAFe, Lean Six Sigma or DevOps – are accelerating the capabilities of organizations across the globe to mitigate commoditization, rapidly onboard acquisitions and more seamlessly respond to increasingly higher expectations for performance and delivery from customers and stakeholders. Where to Start? 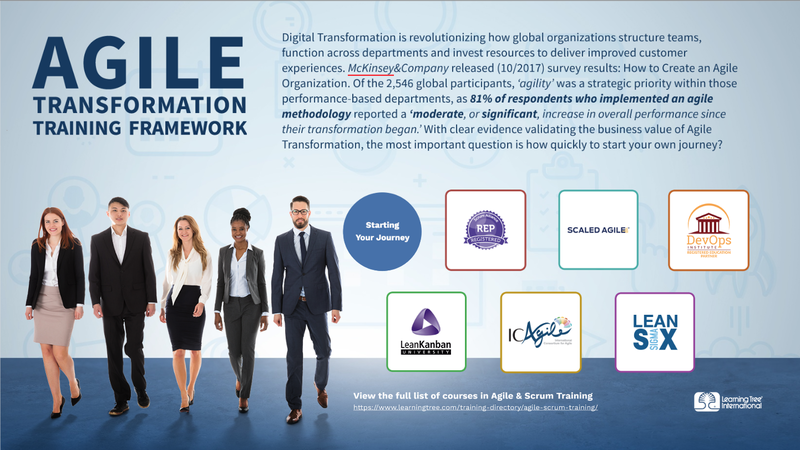 Learning Tree offers the most robust Agile training portfolio of any learning services provider to support your unique Agile transformation needs. IMPORTANT NOTE: A limited approach might not be effective to successfully adopt Agile – there are benefits to the best practices offered by all Agile frameworks. An expert Learning Tree Agile Coach will contribute their experience and expertise in helping assess an Agile Transformation strategy that best serves your organizational vision. Collaborate with an expert Learning Tree Agile Coach to design, develop and deploy an Agile Transformation Vision/Strategic Plan for embarking on an organizational Agile Transformation. Building on efforts you may have already begun, our Agile Coach will assist in collaborating on required policies for reorganization and resource allocation, as well as employing mentoring services to facilitate Agile strategy implementation throughout your organization. An expert Learning Tree Agile Coach will support Human Resources, and other critical department leaders identified, in providing guidance on the required structure, job roles and key competencies of the new organization – creating a Lean matrix structure, hands-on governance, empowered Communities of Practice, open environments, active partnerships and accountability metrics. Most importantly, work with an expert Learning Tree Agile Coach to institute role mobility and multi-disciplinarian team structures for critical roles within an Agile organization including, but not limited to: Programmers, Systems Engineers, Testers, Business Analysts, Product Owners, Marketing Managers and Project/Product Managers. Our Agile Coach will provide guidance on skills, collaboration techniques, and communication strategies to amplify performance over process. Assess the Current State of specific organizational business/ technology practices with an expert Learning Tree Agile Coach to help define the Future State. The Future State will generate rapid results with a focus on iterative deliverables. Enterprise transparency will be created through modern reporting practices. Continuous learning will become the mantra, and all future decision-making is exclusively action oriented. Major IT Modernization efforts focus on digital transformation, rapid & continuous delivery, DevOps and a renewed focus on engineering. Partner with Learning Tree to receive coaching and counsel on critical strategies for Optimizing Workforce Performance to leverage new technology, modern tools and evolving business practices. Planning or Implementing Your Agile Transformation Roadmap Now? Contact your friends at Learning Tree! We’ll connect you with our team of expert Agile Coaches who are qualified to listen, learn and deliver value throughout your Agile Business Transformation.